The research in the Joint Laboratory of Glass VILA covers two main areas – the relation between composition, structure and properties of oxide glasses, and the study of processing, microstructure, and properties of polycrystalline ceramic materials. The first area involves the study of volume, structural and enthalpic relaxation processes in silicate glasses, thermodynamic modelling and molecular dynamic simulations of the structure of glasses, study of processes during the glass batch melting, electrochemistry of glasses and glass melts, development and optimisation of new glasses for industrial applications, and corrosion of glasses by aqueous media. Special attention is paid to glasses without a typical glass-former (e.g. aluminate glasses) and their optical and photoluminescence properties. The second area covers mainly polycrystalline alumina-based materials, with special attention paid to liquid phase sintered (LPS) aluminas, solid state sintered aluminas with submicron microstructure, and alumina based ceramic matrix composites, their microstructure characterisation and mechanical properties (e.g. wear, creep). New topics include the corrosion of structural ceramic materials, including bioceramics, in aqueous media. Head of department: prof. Ing. Dušan Galusek, DrSc. ČERNÁ, Andrea – CHROMČÍKOVÁ, Mária – MACHÁČEK, Jan – HRUŠKA, Branislav – LIŠKA, Marek. Viscosity and configuration entropy of glasses for CHROMPIC vitrification. In Journal of Thermal Analysis and Calorimetry, 2018, vol. 133, p. 365-370. ČERNÁ, Andrea – HRUŠKA, Branislav – TOKARČÍKOVÁ, Darina – CHROMČÍKOVÁ, Mária – LIŠKA, Marek. Optical microscopy, Raman spectroscopy, and AFM study of heavy weathered surface of barium crystal glass. In Chemical Papers, 2018, vol. 72, no. 9, p. 2153-2158. HRUŠKA, Branislav – OSIPOV, Armenak A. – OSIPOVA, Leyla M. – CHROMČÍKOVÁ, Mária – ČERNÁ, Andrea – LIŠKA, Marek. Thermodynamic model and high-temperature Raman spectra of 25Na2O.75B2O3 glassforming melts. In Journal of Thermal Analysis and Calorimetry, 2018, vol. 133, p. 429-433. CHROMČÍKOVÁ, Mária – GAŠPÁREKOVÁ, Eleonóra – ČERNÁ, Andrea – HRUŠKA, Branislav – LIŠKA, Marek. Structural relaxation of lead and barium-free crystal glasses. In Journal of Thermal Analysis and Calorimetry, 2018, vol. 133, no. 1, p. 371-377. PARCHOVIANSKÝ, Milan – PETRÍKOVÁ, I. – BARROSO, G. – ŠVANČÁREK, Peter – GALUSKOVÁ, Dagmar – MOTZ, Günter – GALUSEK, Dušan. Corrosion and oxidation behavior of polymer derived ceramic coatings with passive glass fillers on AISI 441 stainless steel. In Ceramics-Silikáty, 2018, vol. 62, no. 2, p. 146-157. PRNOVÁ, Anna – PLŠKO, Alfonz – VALÚCHOVÁ, Jana – HALADEJOVÁ, Katarína – KLEMENT, Róbert – GALUSEK, Dušan. Crystallization kinetics of glass microspheres with yttrium aluminium garnet (YAG) composition. In Journal of Thermal Analysis and Calorimetry, 2018, vol. 131, no. 2, p. 1115-1123. ISSN 1388-6150. PRNOVÁ, Anna – PLŠKO, Alfonz – VALÚCHOVÁ, Jana – ŠVANČÁREK, Peter – KLEMENT, Róbert – MICHÁLKOVÁ, Monika – GALUSEK, Dušan. Crystallization kinetics of yttrium aluminate glasses. In Journal of Thermal Analysis and Calorimetry, 2018, vol. 133, no. 1, p. 227-236. SVOBODA, Roman – MÁLEK, Jiří – LIŠKA, Marek. Correlation between the structure and relaxation dynamics of (GeS2)y(Sb2S3)1 – y glassy matrices. In Journal of Non-Crystalline Solids, 2018, vol. 479, p. 113-119. SVOBODA, Roman – BULÁNEK, Roman – GALUSEK, Dušan – HADIDIMASOULEH, Roghayeh – GANJKHANLOU, Yadolah. Crystal formation in vanadium-doped zirconia ceramics. In CrystEngComm, 2018, vol. 20, no. 22, p. 3105-3116. Principal investigator from IIC prof. Ing. Dušan Galusek, PhD. Principal investigator from IIC Ing. 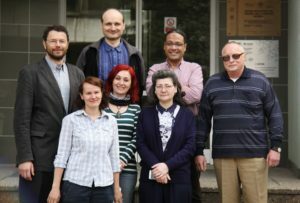 M. Chromčíková, PhD.